It is hard to imagine a clearer win than making kids’ lunches healthier, cheaper, and better for the planet. With soaring child obesity and diabetes rates, tight budgets, and a looming climate crisis, an inspiring story from Oakland, California shows how shifting school food menus can make a big difference on all these fronts. A new groundbreaking study by Friends of the Earth in conjunction with the Oakland Unified School District (OUSD), shows that schools can make lunches healthier and more climate-friendly while saving money. 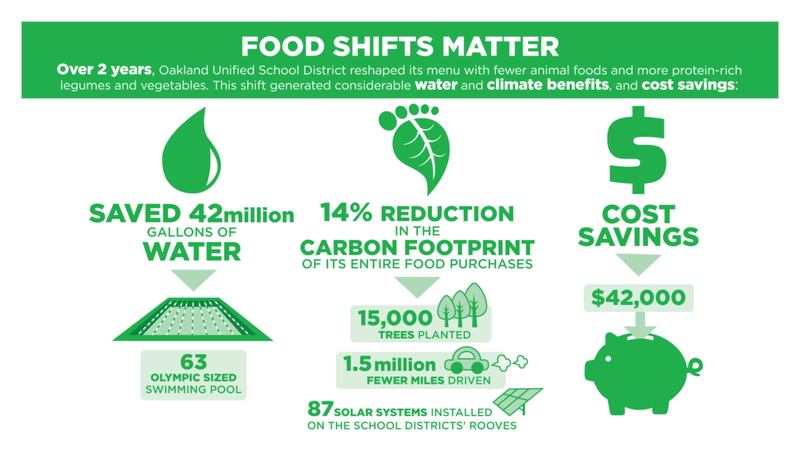 In just two years, by scaling back the meat and cheese in kids’ lunches and serving more plant-based nutritious meals, OUSD reduced the carbon and water footprints of its food service by 14 and six percent respectively. Meanwhile, the district saved $42,000 by cutting its meal costs and it was able to serve better quality and more sustainable meat from organic, grass-fed dairy cows. Research shows that meat-centric diets play a major role in climate change, and that industrial animal production guzzles huge amounts of water. Data also show that American men and teenage boys are eating far more meat than is recommended by U.S. Department of Agriculture dietary guidelines. Overconsumption of red and processed meat is associated with higher rates obesity and other diet related diseases. Across the nation, schools are increasingly a locus of climate leadership, especially in the area of green energy. San Diego schools, for example, have launched a bold climate action plan to make the state’s second-largest district 100 percent renewable energy-powered by 2035. Yet school food is often ignored as a climate solution. By demonstrating the substantial climate and water benefits from reducing animal foods, the Friends of the Earth report shows how greening school food can be a critical ingredient for combating climate change — just as important as making schools more solar-powered and energy efficient. 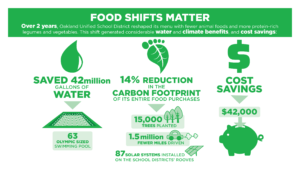 The carbon reduction achieved by just this one school district’s shift in food purchases — with no additional cost — is equivalent to driving 1.5 million miles less per year, covering all of OUSD’s roofs with solar panels, or planting 15,000 trees. During a time of critical drought, the district’s meat reduction saved 2.3 million showers’ worth (or 840,000 bathtubs) of water. If every school district in the nation took similar actions, it would slash the country’s carbon footprint by 700 million kg CO2-eq — akin to removing nearly 150,000 cars (driving 1.6 billion fewer miles) for one year, or installing 99,000 residential solar systems. However, introducing new menu items cannot happen overnight. “Kids can be picky eaters. And many school food directors are concerned how meal participation rates will be affected if they serve healthier, more plant based meals,” says Diana Cimino an advocate with the Human Society of the United States (HSUS) who is working to promote healthy, plant-based food in New York’s school district. 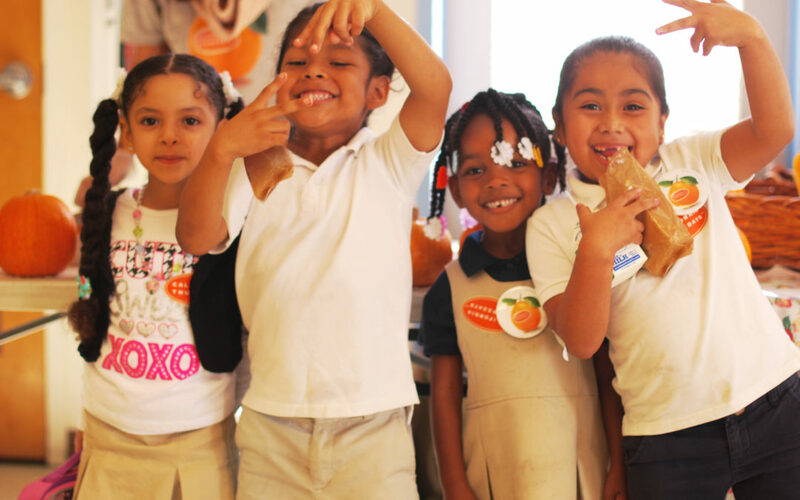 While these concerns about student participation are pervasive, OUSD’s expansion of local, regional, fresh, and tasty plant strong meals actually increased student satisfaction, according to internal studies. How did Oakland Do It? Key to Oakland’s success in reducing its purchases of animal products by 30 percent was its ability to purchase and prepare (from scratch) healthier, fresh, locally grown food. 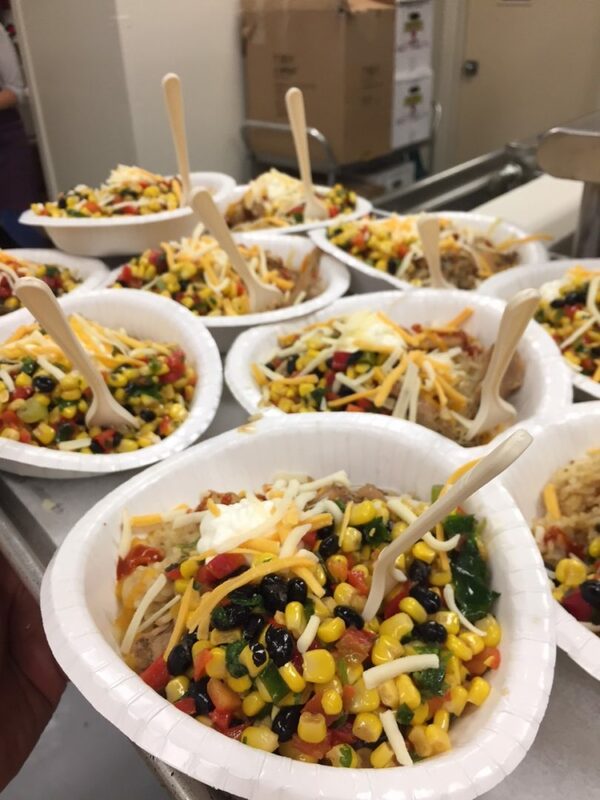 As part of its Lean & Green Wednesday program, OUSD redesigned its lunch menus to include blended meat-veggie dishes like bean and beef chili, as well as popular plant-based dishes such as vegetarian chili, vegetarian nachos, and tostadas. Alexandra Emmott, OUSD’s farm to school director, emphasizes the “important training and support that we have provided to our dedicated food service team.” Also several organizations partnered with Oakland to help them achieve these impressive results. Starting in 2008, Oakland schools launched a partnership with the Community Alliance with Family Farmers to expand its purchases of fresh local produce. The district now sources 40 to 80 percent of its fresh produce locally, depending on the season, according to OUSD. Building on this momentum, in 2014 the Oakland Board of Education adopted the Farm to School Resolution, declaring its “support for school-based programs that connect students and families to the local food system.” With inspiration from successes in Oakland, the Center implemented California Thursdays, a program that promotes purchases from local and regional California farms. And in 2016, the school district adopted the Good Food Purchasing Program that helps it meet standards for better nutrition, animal welfare, labor, and environmental sustainability. More schools are showing it is surprisingly easy to downsize their meat portions and serve more healthful and lower carbon plant-based meals. Expanding on the popular Meatless Mondays movement — which now includes about 140 K-12 school districts and 155 university campuses — schools in New York, Detroit, and a handful of other locales are making plant-based meals a larger slice of what kids eat in school. Some districts, such as Novato, California schools, have stopped serving carbon-intensive red meat altogether. A few hundred miles to the south, the Physicians Committee for Responsible Medicine is suing California’s Los Angeles Unified School District (LAUSD) and Poway Unified School District to prevent them from serving students processed meats — including hot dogs, pepperoni, and luncheon meat — which are linked to colorectal cancer. Separately, the LAUSD Board has just approved a resolution requiring the school to offer a vegan meal option at every lunch. Detroit, another Meatless Mondays participant, began overhauling its school lunches in 2009, according to Civil Eats — trading away hot dogs, chicken nuggets, and other processed fried foods for more plant-based meals emphasizing grains and veggies. Under the leadership of Betti Wiggins, executive director of Detroit’s Office of School Nutrition, more than 140,000 students now eat brown rice, go meat-free every Monday, and are introduced to one new raw veggie a week. “Thanks to Wiggins, Detroit Public Schools now buy 22 percent of their produce, including potatoes, apples, squash, peaches, and asparagus from farms around the state,” Civil Eats reported. In New York City, nearly 100 schools are serving an “alternative, healthier menu” created by the New York City Department of Education, including grass-fed beef burgers. These meals typically only include meat three times a week — and are far more environmentally friendly than the standard meat-centered meals that most New York schools still serve. For schools interested in transitioning to healthier meals with a lower environmental footprint, there are a host of resources and organizations available to help make it happen — and to quantify the impact, including Friends of the Earth, Center for Good Food Purchasing –– and a whole team at HSUS. As Middleton explains, the plant-based school lunch movement involves far more than putting a few new food items on a plastic tray. At HSUS, Middleton’s 20-person team includes a chef, nutritionists, a former school food service director, and others who help train school lunch staff, teachers, and students alike in culinary skills, nutrition, and health. Advocacy to get the federal government to offer more plant-based protein foods and change the way foods are credited, so that high protein grains like quinoa count as a protein. To learn more, you can find Friends of the Earth’s full report and additional articles and resources here. Please be in touch with jkrauspolk@foe.org if you are interested in working with Friends of the Earth to make school food healthier for kids and better for the environment. Kari Hamerschlag is deputy director for food and technology at Friends of the Earth and co-author of Shrinking the Carbon and Water Footprint of School Food: A Recipe for Combating Climate Change. Christopher D. Cook is the author of Diet for a Dead Planet: Big Business and the Coming Food Crisis. He has written for Harper’s, the Economist, Mother Jones, Los Angeles Times, and Christian Science Monitor. See more of his work at www.christopherdcook.com.